After a detailed analysis of the Ismaili Dua in which we analyzed how Ismāʿīlis are made to invoke Karim Aga Khan in their daily prayers in our previous article, we now analyze how Aga Khan himself, over the course of the last century emphasized his position as the present-day reincarnation of ʿAlī‎ (ra) and how he has repeatedly equated ʿAlī‎ (as) to Allah. Below are excerpts from the most trusted book of Aga Khan’s sermons (also known as ‘Farmans’). 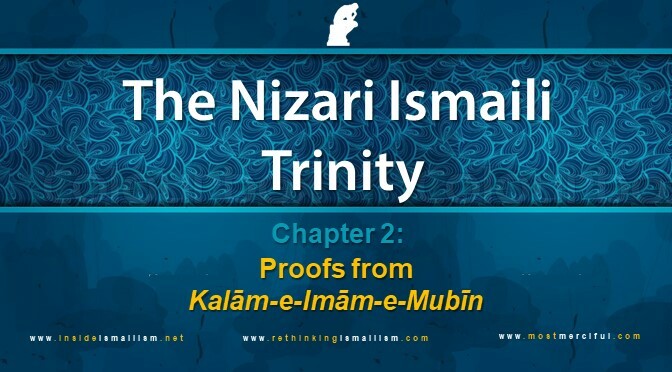 The book is titled “Kalam-e-Imam-e-Mubin” and is used widely in brainwashing Ismāʿīlis from childhood and available in most Ismāʿīli households, though circulation and printing of this book has now been curtailed by almost all Ismaili religious institutions in the world. These farmans of Aga Khan clearly establish that he claims to be the current reincarnation of ʿAlī‎ (ra) and that ʿAlī‎ (ra) is Allāh‎. Ismāʿīlis therefore believe that Aga Khan is Allāh‎ and their daily rituals and worships affirm their faith in Aga Khan. ‘Ek vakhat H. Amirool Mominin Maula Murtaza ʿAlī ‘furaat’ nadi na kinaarey gayaa; aney ghodaa upar sawaar thai “ʿAlī Allāh” maannaari kom paasey pohochyaa tey “ʿAlī Allāh” maannaari kom evi chhe, jey Murtaza ʿAlī ney Khudaa samjey chhe. Tey kom na ek maanas ney potaa paasey bolaavi ney farmaavyu ke, shu tu ʿAlī Allāh kahey chhe? Teney kahyu ke, ‘maney bharoso chhe aap Khudaa chho!’ pachhi Maula Murtaza ʿAlī ey tenu maathu kaapi naakhi, maari ney paachho jeevto kariney farmaavyu ke tu maney ʿAlī Allāh shaa maatey kahey chhe? Tyaarey tey maanasey jawaab maa araj kari ke, aapey maney maari naakhi fari jeevto karyo, jethi havey maney jey kai shak hato tey nikdi gayo chhe, aap sahi “ʿAlī Allāh” chho. Murtaza ʿAlī ey hukam karyo, aa shakhs ney dungar upar lai jai katkaa thaay evi ritey feki diyo. Tyaarey teney tevi ritey feki devaa ma aavyo. Baad teney fari sajivan kari Maula Murtaza ʿAlī ey farmaavyu ke, tu ʿAlī Allāh haji boley chhe? Tyaarey teney aadhintaa thi jawaab aapyo, jey katkaa kari, maariney sajivan karey, tenaa upar maaru iman vadhyu chhe. “One day Hazarat Amirul Momneen Mawla Murtaza ʿAlī went to the bank of river Furat, riding his horse”, said the Aga Sultan Muhammad.” ʿAlī‎ reached a community of “ʿAlī‎ Allāh‎”. Members of the community believed Murtaza ʿAlī to be Allāh”, continued the Aga Khan. “ʿAlī called one member of the community and enquired: ‘Do you say ʿAlī Allāh?’. The member replied: ‘I have faith, you are Allāh’, (nauzbillah). Thereupon, ʿAlī beheaded him and brought him back to life and asked: ’Why do you call me ʿAlī Allāh?’. The member replied: ‘You killed me and then brought me back to life, now whatever doubt I had has been thrown out. You are truly ʿAlī Allāh’. Murtaza ʿAlī ordered that the person be cut into pieces and thrown from the mountain. The order of ʿAlī was carried out. He was again brought back to life by ʿAlī and asked: ‘Do you still call me ʿAlī Allāh?’. Thereupon the person very obediently replied: ‘My faith has become stronger on the one who can cut a person into pieces and then bring him back to life”. Continuing the narration, Aga Khan said to his Jamat: “The member was killed many times and in many styles and every time brought back to life and asked: ’Do you yet call me ʿAlī Allāh?’ and the person kept on saying: ’You are truly Allāh. The one who kills and gives life be called Allāh”. The above farman establishes the belief in the mind of a Ismāʿīli that ʿAlī‎ is Allāh‎. “Our grandfather Hazrat Maulana Murtaza Ali was called Allah by Nuseri, he was killed 70 timez but still kept calling Ali as Allah. Thereafter came a Commandment that this (Nuseri) is a True Momin, and his progenies will also be of such truthfulness. This Momin and his progeny will be exempt from questioning on the Day of Reckoning. He achieved that status because of his Iman (faith)”. “ʿAlī-nu Noor” hatu aney amaara-ma pun tej noor utaree aavelu chhe. Amey temna gaadiwaras chieye. Noor hamesha haazar naazar chhe, fakt naamo juda juda hoy chhe. Maula Murtaza ʿAlī-ni gaadi qaayam chhe aney qayaamat sudhee qaayam reheshey. Tamo Jamat-ney koi pun reetey dilgeer thavaanu kaaran nathi’. “Amey tamaari paasey mawjood chieye. Teo aney amaara ma kaiy farak nathi; jisam badlaavu padey chhe. Maatey aa upar-ni waat saachaa imaandaar murido-ey samajhvi joieye”. “We, the Noor of Murtaza ʿAlī‎, are present and are sitting in front of you, the Jamat.We change keep changing body in this world,but the “Noor” is same that of ʿAlī‎. Only body changes but the Noor i.e. soul is of Hazrat ʿAlī‎”. In the town of Mundra, Cutchh, India, on the 21st day of November 1903, eighteen years after the above narration, Aga Khan III narrated another historical event from the life of Hazrat ʿAlī depicting him as ʿAlī Allāh. Hazrat Ameerool Momeeneen na vakhat ma ek yuvaan etley beejaa mulak no rehvaashee Musalmaan hato, teney ek divas, H. Ameerool momeeneen nee huzur ma aaveeney araj karee ke, yaa Khudaavand ! hoo imaani chhoo aney tamaaraa upar maney purey puro ittekaad chhe. Beejaa musalmaano jem tamney samjey chhe, tem hoo tamney samajto nathee. Hoo tamney Khudaavandey aalmeen ghanu chhoo aney maaraa Khudaavand tareekey tamey durast chho. Aa upar thee ameerool moameeneen ne jawaab deedho ke, tu yavan pardeshee chho, chhataa pun maaraa upar taro aavo sampurna ittekaad chhe, tethee tu maaree huzur maa chho; pun jo maaraa upar taro vishvaas na hoy aney raat divas tu maaree paasey raheto hoy, tou pun tu maaraa thee door chho. Tamey pun sarvey jamaat tamaaraa dil saathey evee reetey choksee karo ke, tamey amaaree pasej ho. Amey tou tamaaree pasej chhieye. At the time of Hazrat ʿAlī a young Muslim from foreign place came to Hazrat ʿAlī and said” Ya Khudavind (My Lord) I am faithful and I trust you. I do not consider you as other Muslims consider. I believe you as my God and you are perfect as my God. This time Hazrat ʿAlī replies: “You are a foreigner from Yemen and yet your faith in me (as Allāh) is so complete. You are therefore with me. But, if you were to be with me physically day and night, and yet had no faith in me, you would be away from me”. “All you members of the Jamat, make a firm commitment with your heart that you too are with me. We are with you”. The above establishes the belief in the mind of a Ismāʿīli that since every Imam is a reincarnation of ʿAlī‎ (ra), therefore the current Aga Khan is ʿAlī‎ (ra), and since ʿAlī‎ (ra) is Allāh‎, therefore Aga Khan is Allāh‎. If a Ismāʿīli’s faith was that of Nuseri or if he happens to be or claims to be a True Momin (true believer) like Nuseri, then he must admit without doubt that Aga Khan is Allāh‎. From above farmans of Kalam-e-Imam-e-Mubin and from the indoctrination by Ismāʿīli missionaries such as Al-Waez Abu Aly A. Aziz in his book Ismāʿīli Tariqah, we can see how Aga Khan has himself not only claimed to be the reincarnation of ʿAlī‎, but he has also equated ʿAlī‎ to Allāh‎, and this understanding affirmed by Ismāʿīli scholars. This is exactly what the Ismāʿīlis believe and accordingly they structure their prayer (Ismāʿīli Holy Dua) worshipping and glorifying the Aga Khan instead of Allāh‎ in their daily prayers. Refer to the article “The Ismāʿīli Trinity” for an analysis of Ismāʿīli prayer and how is the shirkiya concept of the Ismāʿīli Trinity built into the Ismāʿīli prayer which they recite every day, and at the end of the prayer, ask for helath, wealth, happiness and forgiveness of sins from Aga Khan.